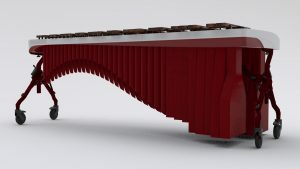 "The Bogdan Bacanu Signature marimba is powerful, bold, fresh and elegant"
The instrument is designed by KesselsGranger DesignWorks. The instrument is only available with a 5-octave keyboard. The keys are made of hand-selected Honduras rosewood and feature Adams Alpha tuning, the most advanced tuning method for marimbas in the world. 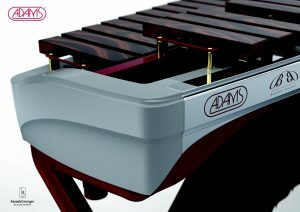 Visually the instrument is a follow-on from the Adams Alpha series that fulfils the requirements of the marimba virtuoso perfectly. The main colour combination is white-red. Just as with the Alpha series, the central section is neatly hidden away between the chamfered resonators. On the Bogdan Bacanu model, however, a different laser cut is used to make the chamfer itself more extreme. 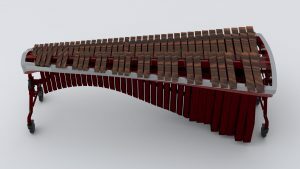 The resonators are available in red or white - whatever the marimba artist prefers. All the oak frame parts are finished in hard, glossy varnish. White on the outside and red on the inside. The slats, containing beautiful woodworking, fit perfectly on the two oak side pieces. A trend that Adams used for the Alpha series. It makes the instrument more distinctive, gives it a smaller geometry and reduces frame sound. The side part on the bass section of the new instrument has a flowing rounded curve that gives the instrument a stylish, elegant look. The successful Voyager model with a raised central section is used as the basis for the frame. The height adjustments have also been specially designed for this version and contribute to the instrument's distinctive look. 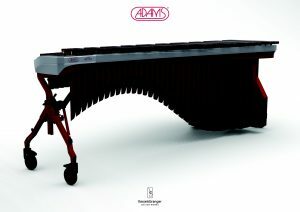 The new Adams Artist marimba, Bogdan Bacanu signature model: powerful, bold, fresh and elegant. I am originally a pianist and so am used to a Steinway on stage. 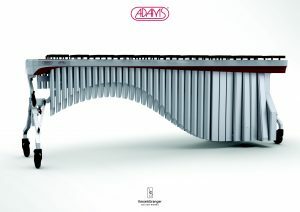 When the Alpha marimba was introduced, it was the very first design marimba on the market. An instrument with superlative tuning and sound quality. So I now have an instrument whose sound is matched perfectly to my requirements and style. It means that I never have any tuning problems when I play in an orchestra or ensemble. And anyone who knows my playing style will know that I can play with a great deal of power. However, I still had a number of wishes regarding the design. But this dream was realized when I went into the process in more detail with Adams and KesselsGranger. 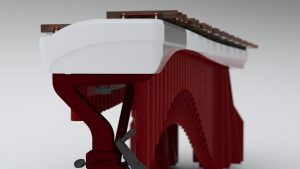 Right from the very start I stated that the marimba had to be elegant, but also provoking. The combination of colours, shapes and materials and finishes has resulted in a stunning instrument. I also wanted the woodwork of the frame to be finished with glossy varnish and this has been done too. The colours selected are not standard for the marimba - this gives the instrument a fresh, modern look and the shape is extremely elegant. 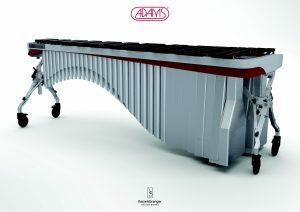 This marimba shows to advantage in a classical concert hall, but also in a modern industrial setting. When we were asked by Frans Swinkels to develop a special series marimba for Bogdan Bacanu, we took the occassion with open arms. We remember our first meeting with Bogdan, when he mentioned: "Perfection does not exist. It can always be better." With this great challenge ahead, KesselsGranger DesignWorks pushed the boundaries that were explored with the successful Alpha Series design even further. We set out to design an emotional instrument, inspired by objects that are close to Bogdan's heart. It goes without saying that Bogdan's musical career began on the piano, when at the age of four he received his first piano lessons. We identified the perfect glossy paint as one of the most emotional aspects of piano design in terms of appearance, often with a separate colour scheme for outside and inside the instrument. Together with Sterkendries John, an automotive company specialised in high-qaulity automotive paint, we developed a scheme whereby we aimed to surpass Bogdan's every expectation. The result is a breath-taking combination of pure white on the exterior and a deep blood red interior, both hues resplendent in high gloss finish. 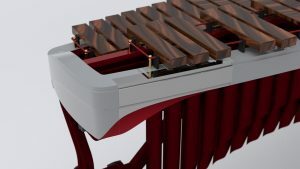 The innovative frame of the marimba further explores the wraparound concept, pushing the envelope even further. For instance, both end pieces are curved producing an incredible feeling of energy in the instrument. 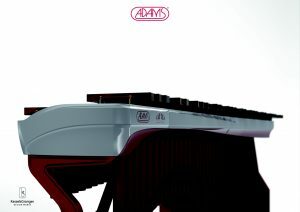 Bogdan's love of Johann Sebastian Bach, theatrical settings and yet also highly modern and pure shapes, inspired a number of flowing and stylised floral Baroque lines in the instrument, including the personalised wing that is inscribed with his initials, a graphic feature also carefully redesigned by KesselsGranger DesignWorks. Furthermore, the specially crafted wing-shaped supports of the Voyager frame give the appearance of the instrument an added lightness, a suggestion towards the uplifting music that Bogdan plays. 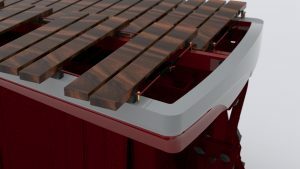 We sincerely enjoyed working with Bogdan on the design and wish him lots of success and pleasure with his new instrument, opening a new chapter in marimba design and further inspiring the next generation of marimba players worldwide.